When we lived in the UK, we were fans of Pepsi Max. Since Viola and I were often on diets, it was a good idea to find a soft drink that we really liked. And we really liked Pepsi Max. It was marketed in the UK, where it appeared in the early 90s, especially at men. It avoided the "diet" tag, which apparently put off men, and went with the slogan "maximum taste, no sugar". When we arrived in the USA, we were surprised to see absolutely no sign of it. Every other coca cola under the sun, but no Pepsi Max. 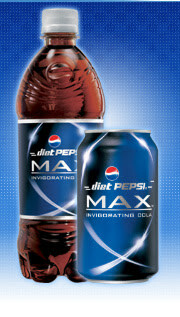 And then recently, when we were in Seattle, we saw a product called "Diet Pepsi Max" on the shelves. We concluded that it must be a North Carolinian oddity to be a Pepsi Max free area. But then two or three weeks ago, it appeared in our local Kroger, and at only $1 (50p!) a two litre bottle. We stocked up, and it's been great to be drinking it again. The product remained unavailable in the United States until only recently (The U.S is PepsiCo's native market, and the largest consumer of carbonated soft drinks), where one of its principal ingredients had not yet been approved by the Food and Drug Administration. The ingredient in question—acesulfame potassium—is combined with aspartame to provide the beverage's sweetness. Some people claim that this results in a better taste than that of other diet colas (most of which are sweetened with aspartame alone). Unfortunately, there is a downside. I had never realized that Pepsi Max is much heavier on caffeine than are traditional cokes. Energy Fiend has the breakdown and notes that "a 12 ounce can of Diet Pepsi Max contains 69 milligrams of caffeine" in comparison with regular Diet Pepsi, which has 36mg per 12oz can. So we are enjoying our Pepsi Max again, after two years without it, but avoiding the caffeine overdose by drinking plenty of other new favourites like American diet lemonade (a kind of lemon squash) and diet root beer (not drunk at all by Brits, an acquired taste, but very pleasant once you are used to it). And lots of green tea. behfdcnyIt's also testament to the expertise of Pepsi in the way in which they do their market research, branding and advertising. Pepsi are the absolute kings of placing exactly the right product in the right place at the right time. I guess what happened was that Pepsi Max developed it specifically for the European market in the first place, spotting a gap in the market (and there aren't many in the carbonated drinks field). Interesting to compare them with Coca Cola which has had some disastrous attempts at placing new products on the market, but what Coca Cola are good at doing is distribution. While Pepsi were working on their advertising in the 90s Coca Cola were quietly buying up all the bottling plants in Eastern Europe - the result, you are more likely to see a can of Coca Cola in a shop in Eastern Europe than Pepsi. While I'm thinking about it, it reminds me of that lovely bit in 'Goodbye Lenin' when the Coca Cola banner descends on the side of the building. I don't know, but being much heavier on the caffeine sounds more like an upside than a downside to me. I once tasted coca cola at the University all of 40 years ago. Hated it. Never drunk it since, and have no intention of ever doing so in the future. And that goes for all varieties - max / pepsi / caffeine rich ... You name it, I'll give it a miss. Q has tasted cola more recently than selwyn42, but he is more likely to use it to clean tarnished metal than to drink it. It is very good for shifting stubborn carbon deposits from the gas parts of automatic weapons... Its other alleged use is as a type of contraceptive, but Q had better not go into that, not being a medical man! I miss . . . . Speaking as a feminist myself . . . .
An American Life on Mars? Just how good is the new Doctor Who?